Malaga's port is one of the oldest ports in the world with over three thousand years of antiquity, it is now one of the most important cruise ship terminals in Spain. Bringing many thousands of passengers onto Malaga’s sunny shores every year. The port is conveniently located near the city centre, within easy walking distance to all of Malaga’s cultural and historical highlights. 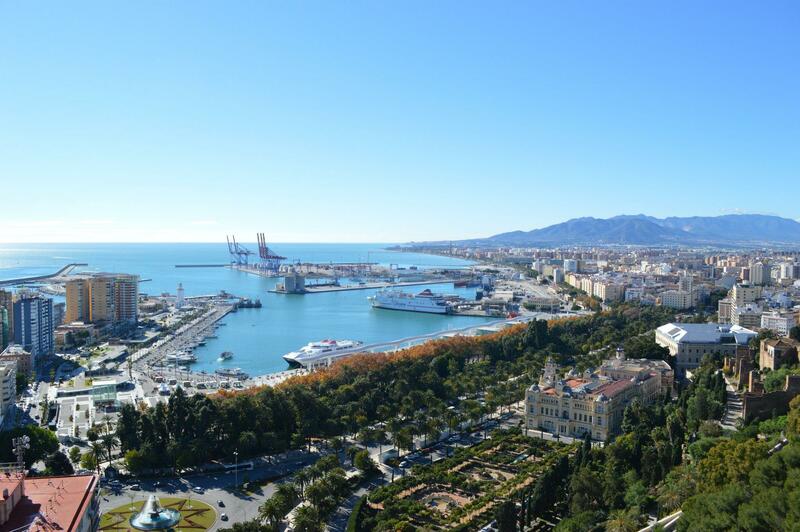 One of the city's biggest parks is right across the road (for a video of the Parque de Malaga), as is the Alcazaba, the Gibralfaro castle and its just a short walk to Malaga's historic centre and the main shopping areas - including Calle Larios. A visit to all is easily doable in a few hours. 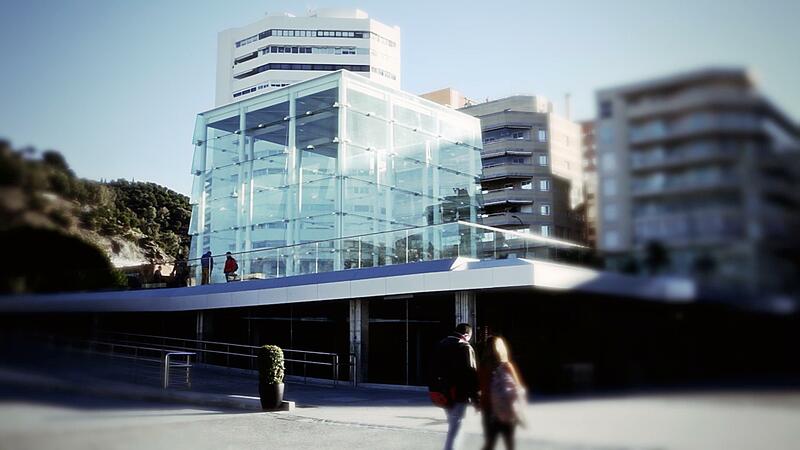 For cruise ship passengers, the location is ideal, you can be in the heart of Malaga within five minutes. Until fairly recently, Malaga's port was off-limits to members of the public. Over the last ten years, there have been two projects aimed specifically at Malaga's port and the surrounding areas. An expansion plan and the city-port plan. The expansion plan is ongoing and has so far opened up 11 docks as shipping and cruise ship terminals. 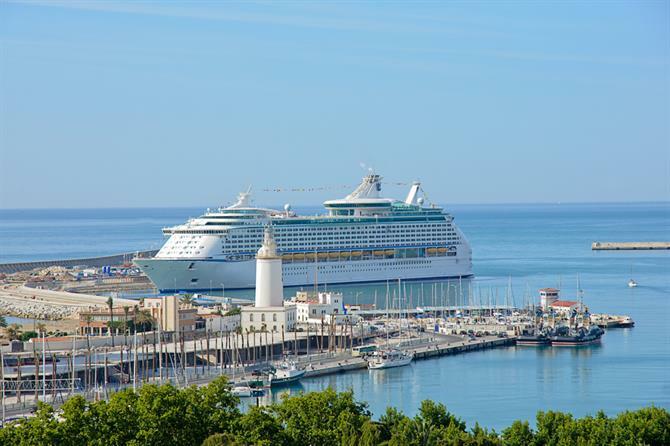 There are now over 700,000 passengers arriving on Malaga's shores from 220 different cruise liners. This number has been growing rapidly over the last few years. Malaga's port is now one of the most important in Spain. The city-port plan was devised to develop the port area for recreational and commercial use. The ultimate aim of the city-port plan was to attract private investment - something that hasn't happened as quickly as hoped. Its two biggest projects to date, have been the openings of Muelles Uno and Dos. Quays one and two. The quays are situated side-by-side and the names are are often used interchangeably by local Malagueños. Muelle Uno was opened at the end of 2011. The 14,000m2 shopping and commerce centre is home to restaurants, shops and has underground parking for over 1000 cars. The most exclusive part of the port, it is home to Malaga's onlyMichelin-starred restaurant (Jose Carlos Garcia's) and has a marina for luxurious yachts, known as "Ricardo Gross." Despite its exclusivity, there are also numerous other cafés and bars that cater for all tastes and budgets (including an Indian restaurant). Muelle Dos is home to the beautiful waterfront promenade invitingly named “The Palm Garden of Surprises,” "Palmeral de las Sorpresas” in Spanish. The promenade is an ideal place for families with small children. There are ample gardens, several children’s playgrounds, water features, and various activities to keep them entertained for hours. There are also numerous benches and quiet corners for people to sit and soak up the atmosphere. The whole complex is very modern and elegantly designed. There are 420 recently planted palm trees lining the walkway and a further 7400 trees and tropical plants that make up the gardens. The whole area offers a surreal, modern feel to it. You can fully understand why Malagueños are proud of the newest addition to their city's sights. There is no better place to enjoy an evening's ‘paseo’ and a bit of people watching.Very different to the old Malaga we all know and love. For more information and pictures see Spain Holiday’s Facebook page and for things to see and do in Malaga. 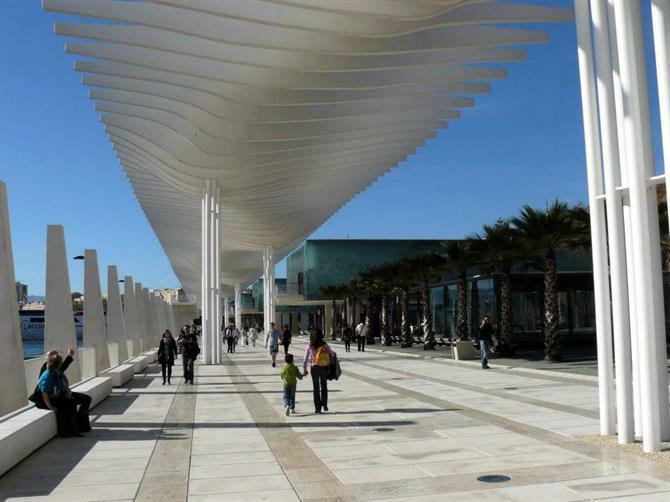 Malaga's port has been selected as the site for the next Pompidou Centre. The first time the museum is to be located outside of Paris. The new Pompidou centre will occupy, "El Cubo" - the cube, an existing glass structure that is situated right at the end of Muelle Uno. Malaga's Mayor, Mr. Francisco de la Torre Prados has recently been revealing more details in London's 2014 WTM, stressing that the Pompidou centre is Malaga's ‘Proyecto Estrella - Star Project.’ Various sources at the Travel Market have confirmed that the centre is due to open between the 20th and 25th of March 2015. El Pompidou de Málaga will display works from Bacon, Magritte, Giacometti and Frida Kahlo amongst others. Details are still sketchy, but it is thought the museum will hold around 90 works of art on permanent display, with two or three temporary exhibitions taking place throughout the year. The initial agreement for the Centro Pompidou in ‘El Cubo’ is for five years, with the possibility of extending it for a further five. The entrance to Muelle Dos is at the Plaza de la Marina - see map below. Things to do - restaurants, bars and cafes galore. There's enough choice for all. Several children's parks, a bicycle rental stand,an activity centre (with mini golf), a cultural and maritime museum with an aquarium and almost 70 shops. If venturing outside of the harbour, be sure to check out some of Malaga's best tapas bars for a bite to eat. A boat trip around Malaga’s harbour is highly recommended. There are several companies offering regular outings, some with glass bottomed boats. If lucky, there are pods of dolphin to be seen. All in all, a great way to spend a few hours in Malaga!